Tonight’s challenge is the larval insect at left. 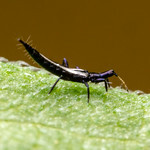 Ten Myrmecos Points to the first person who can name the genus. 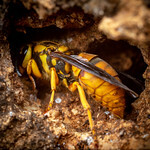 The cumulative points winner for the month of April will win their choice of 1) any 8×10-sized print from my photo galleries, or 2) a guest post here on Myrmecos. I’ll guess Geometridae, but I’ll also guess that there’s a Tachinidae roaming around inside! This is too easy. Clearly a Morpho, possibly M. cypris. Looks like a Morpho to me! Those beautiful green patches are very similar to M. catalina I’ve seen from Costa Rica. It has very hairy eyes! I have no clue what it is, but it’s very pretty. Love all of the hairs and pointy bits! Super cool. I had no idea Morpho larvae were so striking. Makes sense I guess, just have never seen one. Very cool photo.